Finding vegan chocolate-covered peanuts that are free from dairy and yucky insect-based glazes has been almost impossible - until now! 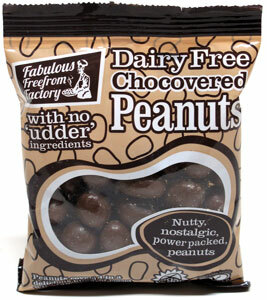 Fabulous Freefrom Factory has come up with their version of the classic treat that's made with dairy-free vegan chocolate and vegetable-based glaze to give you the awesome pairing of peanuts and chocolate without any of the animal-based ingredients you want to avoid. Plus, they're free from gluten as well as dairy, making them safe for those with allergies, and they're also free from hydrogenated fats, artificial colors and preservatives, and all the other junk you don't want in your snacks! Imported from England. 65g (2.3 oz.) packs are $3.99 each. From Lauren Andalora of Salt Lake City, Utah on 11/5/2018 . I bought $60 worth of chocolate for my boyfriend's birthday. These would be perfect if they were salted. Great taste and texture but could use a sodium boost.